A MASSIVE truck bomb ripped through a food market in a predominantly Shiite neighbourhood of Baghdad early yesterday, killing at least 67 people, police said. The Islamic State (IS) group, a mainly Sunni Muslim militant force, claimed responsibility for the blast, saying it had deliberately targeted a Shia gathering place and would carry out ­further attacks in response to bombing of territory it holds in northern Iraq and Syria. The truck exploded in the Jameela market in the Iraqi capital’s crowded Sadr City district shortly after dawn, said police officers. They also said at least 152 people were wounded in what is the main food market serving the Iraqi capital. 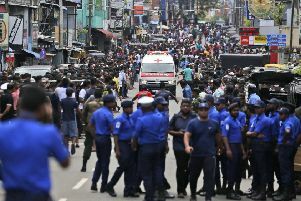 Local residents ran to help the victims, carrying corpses in bin bags and blankets and sending the wounded to hospitals in ambulances or private cars. The blast incinerated much of the market, leaving charred wooden stalls and scattering fruit and vegetables all around. Fire engines and ambulances were at the scene and firefighter were dousing the still-smouldering complex long after the explosion. “On Thursdays the market is especially crowded because people come from the other provinces to stock up on food for the weekend,” one officer said. He said the bomb was in a refrigeration truck, so it was impossible to distinguish it from other vehicles delivering produce to the market. A minibus driver, Hassan Hamid, said he driving past when the force of the blast threw his vehicle about ten yards on to a pavement. Four hospital officials confirmed the casualty figures. In a message posted on an IS-affiliated Twitter account, IS said the attack was carried out by a parked, explosives-laden truck and that IS aimed to have “rejectionists [Shiites] experience the same harm as their bombardments cause to our Muslim people”. The militant group, which roughly controls a third of Iraq and neighbouring Syria in its self-declared caliphate, views Shiite Muslims, as well as other religious minorities, as apostates. It often targets military checkpoints or predominantly Shia neighbourhoods such as Sadr City, with the goal of sending a message to the Shiite-led government in Baghdad. Commercial and public areas are also among the militants’ favourite targets as they seek to undermine confidence in government efforts to maintain security. IS claimed it killed 34 people in a suicide car bombing a Baquba market in eastern Diyala province on Monday.﻿ The Iraqi military launched a large-scale operation last month to retake the western province of Anbar from the Islamic State. A US-led coalition has been reinforcing Iraqi troops for the past year.